I love small scopes! For me, they are the ones that get used more than any other. They are perfect for a short evening outing or an even shorter quick look-see out on my deck. When both time and weather are limiting, they are the way to go. That’s why I have five 60mm to 63mm and four 70mm to 80mm refractors! I just cleaned an 80mm APO and put it on a mount with accessories (diagonals, finder, laser, 2" eyepiece, dew heaters, etc) and man, the weight adds up quick. It's like 12lbs for that little package. I'm always wanting to look at a 102mm or 127mm and constantly fancying a 150mm refractor. I have a 120mm F8 already. And I'm always looking at more refractors. Love those big refractors. But, they're so heavy, big, and really challenging to mounts when they're long (that moment arm!). Just messing around with this 12lb 80mm scope setup, I constantly go back to just appreciating the smaller scopes. As others have pointed out, the scope you use more often because it's convenient, comfortable, fast and isn't just frustrating and heavy is better. As the scope gets bigger, the mount gets way bigger. And then it's just a chore. I have big scopes in my observatory and I've not had to fool with moving things around or setting up and stuff for a while with those scopes (120mm to a 250mm in apertures). But when I'm fooling with a "grab & go" setup at my backdoor, I'm constantly reminded how smaller refractors are just awesome instruments for taking a look without all the fuss and labor of dealing with big scopes and big mounts. 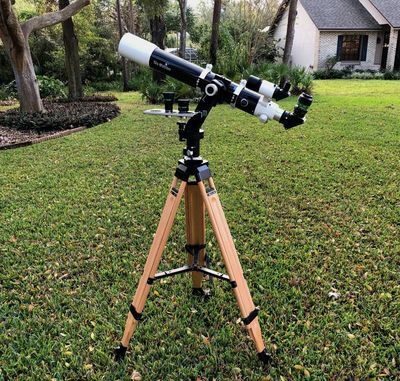 I recently bought a 4 inch apo and find it very easy and convenient to set up, much easier than my former 5 and 6 inch refractors by far!! It has enough aperture to really show the planets beutifully and doesn't require a heavy mount now that I'm older and disabled with back and knee problems. IME, the biggest bang for the buck - and size and weight - is the ST120. 4.7 inches of refractor goodness. It's an f/5 achromat. Not so great for planets and the Moon, but very good for deep sky. My ST120 handles very well on a MicroStar head and Vanguard Auctus 324AT tripod. I can easily carry the entire setup by one hand. I usually move it around several times to avoid buildings and glare from neighborhood lights. New ST120 OTA's are available at Orion for $249. Until recently, they were on sale for $220. Edited by Sarkikos, 28 June 2018 - 06:37 AM. Just to make sure: 12 lbs is for the OTA with mentioned accessories, but without mount? I had the Orion ST100 and enjoyed it so much that I thought the 120 would be better. It was in many respects although it also had more false color. Had a blast with this scope from my summer home in Show Low Arizona. Best views of M31 and the Orion nebula to that date. I tried to make it binoviewer capable by using a specially made Siebert OCA but it was not to be. Eventually my desire to use both eyes won out and I sold it after buying a pair of 100mm binoculars. That was the only way to beat the ST120 on image brightness and wide field with two eyes. The fellow that bought it sent me emails for months after the purchase telling me how much he was enjoying the scope. Another small telescope gem. Yep, like I said, the ST120 is not so great for planets and the Moon. Expect false color on bright objects, and smearing on bright extended objects. But it is great for it's primary function: a grab-n-go, rich-field, deep-sky, low-power scope. I've enjoyed the ST120 immensely observing deep sky objects. I'm not a big fan of binoviewing except for planet/lunar on moderate-sized scopes, like my 10" f/5 Dob, so I don't mind if I can't binoview with smaller scopes. I have a pair of 25x100 binoculars but hardly use them any more. I like the ST120 better because it's easier and more comfortable to use, and I can vary the power. Edited by Sarkikos, 29 June 2018 - 06:18 AM. If I lived in a dark sky site I would get the ST 120. As it is, in the suburbs of Houston, most DSOs are washed out. If I can retire to a dark sky site, I would like to get a sturdy two-headed mount like the Losmandy AZ8 and mount the ST 120 for wide-field, deep-sky stuff, with a long-focus scope for planets and double stars. Right, without the mount. With the mount it climbs probably to 25lbs or more as it's on a Twilight 1 with HEQ5 legs swapped into place, it's fairly heavy now. Not a grab & go in the sense of weight at this point, as it takes effort to lug it around. Makes me want to push towards that little 60mm APO on a wee mount like the Twilight 1, something truly one-hand-grab-n-go. I agree Marty, 25 lbs is transportable, but not grab and go. My 82mm weighs around 12 lbs with mount and that's about the limit I find comfortable for grab and go. A 4” F6 or F7 can be a very capable and compact grab an go instrument. Hi Terra. I don't know how you choose. I have two four inch refractors and they both seem to act like Arnold Horshack from Welcome back Kotter. Grab-n-go is a bit personal l guess. My 102mm fluorite and 82mm ED doublets are shown below mounted on the same mount, a Gitzo 224 with Manfrotto HDV501. I've added a picture of the 82mm at the same place in my living room as the 102mm to make comparison a bit easier. One look at the size of the pan handle relative to the OTA shows how diminutive the 82mm really is. 10.2 kg vs 5.7 kg. 70 cm vs 38 cm minimum length. Low power eyepiece = finder. The ED82 A has become my favorite grab-n-go and gives wonderful views, even if it’s native magnification range is only 25-75x. It’s widest field is 2.4 degrees at 30x. Views throughout the 25-75x range are superb and immensily enjoyable. For me it's an illustration of less is more, especially when traveling. But also when time or energy are limited. Edited by Erik Bakker, 23 September 2018 - 02:00 AM. Don't let light pollution stop you. I live in the suburbs in a bright red zone. There's still plenty to see here with an ST120. Hundreds of deep sky objects. But, true, at a dark site you can see a lot more with the ST120. Lots of factors to consider.. Just how wide is that back door, how strong are you... how far do you have to carry the scope. I consider 15 Kg grab as long as the tripod fits through the back door. I like to put a 2" erect-image non-reversed prism (Amici) diagonal in rich-field scopes. It's makes for extra-added comfort when the view through the telescope matches the view when I look up at the sky. It also matches the view through a RACI finder if I have one on the scope. My Olivon 2" Amici is relatively inexpensive but is a good performer for low-power deep sky. Edited by Sarkikos, 29 June 2018 - 08:36 AM. ... and you don't have to carry the scope and mount down a flight of steps. Edited by Sarkikos, 29 June 2018 - 08:37 AM. I keep lists of objects that I've seen in each of my telescopes and binoculars. So far I've seen 211 deep sky objects through the ST120, right here from a bright red zone suburb. But I've seen 263 through my Canon 10x42 IS binos! Lately I've been slacking. I need to start taking that scope out again. Edited by Sarkikos, 29 June 2018 - 09:50 AM. Finally had first light with the TV76 last night. The Sahara dust has been blowing through the Caribbean for weeks (the dust actually made it to Dallas while I was there yesterday, it’s following me all over the world!). So the sky was relatively steady but the transparency was terrible. Observed Jupiter and Saturn for about 15 minutes until the clouds rolled in again. The scope performed great and I got my quick planetary fix before going to bed. Easy grab and go. Did someone say small scopes? Got a picture of your APM 105 f/6.5? 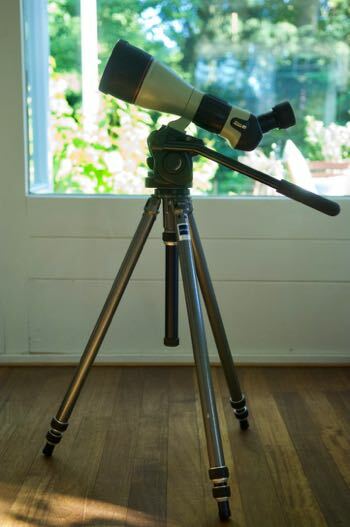 Partly on your recommendation for the OTA from some time ago: Sky-Watcher 100 mm f/9 ED doublet on a Universal Astronomics UniStar Mount and Oberwerk Wooden Tripod. Coincidentally, a bit under 15 kg, as shown. I just fold the legs and carry the whole thing out the door. Great for dodging trees. Light enough that I almost never find myself making excuses on a clear night. It's such a shame that Larry is no longer making these mounts. My TV Ranger (inc diagonal, finder etc) + Dwarfstar mount + Slik master classic tripid weighs around 9 lbs in total. Very "grab and go"
I just switched out my 6x30 straight-thru finder for an Orion Correct Image Right Angle finder on my A70...I've put the finder on "top" of the tube assembly and squared the crosshairs on the finder (I've read in another forum how a Master Observer did the same in his search for finder solutions). 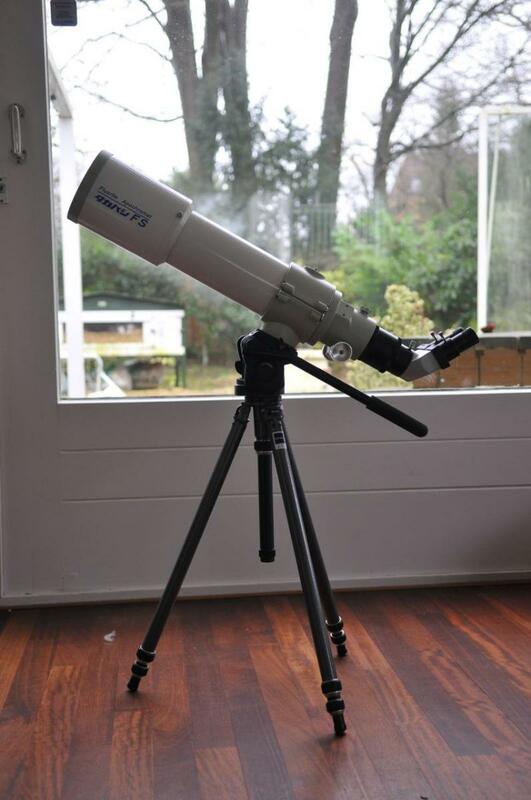 I hope to learn how to star hop with my small refractor. I also rotated the focuser 120 deg. to the right so it's on my left; the finder seems more comfortable there since I usually observe the night sky as it rises out of the east to the meridian. My sleeping routines are out of whack but I'm having lots of fun with my A70. Had another great Jupiter observing session last night of the Salmon colored GRS with the little 82mm ED and just updated the picture to better reflect it's size in post #63 above. Just came in from a wonderful evening with observing Jupiter first and Saturn later in my small 82mm ED. Despite their low positions in our northern skies, images were good with decent seeing, much better than yesterday. At 75x, on Saturn, polar darkening was seen, as well as a darkish brown equatorial band above a lighter yellow equatorial zone. Titan was nicely visible, as were the Cassini division and the different color shades of the inner and outer ring on both sides of the Cassini division. A nice very wide double framed the scene and could well have been mistaken for 2 moons centuries ago. All in all a very joyful evening observing these beautiful two 2 gas giants in our outer solar system.